Founded in 2013 by JiKay, Hot Damn is a collective of creatives with big plans. 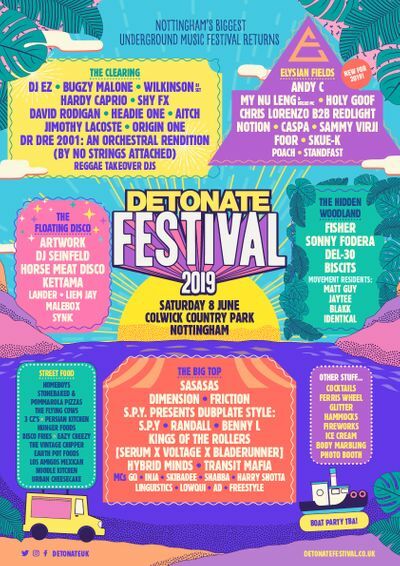 Hot Damn as a label is dedicated to blurring the lines between hip hop and electronic music and that's exactly what you should expect from their takeover at Detonate Festival. Hot Damn's early releases include music from the likes of Mr. Carmack, Stooki Sound and Massappeals receiving support from some of the biggest artists in the game from Rudimental to Flosstradamus. Hot Damn will bring the turn up. Meridian Dan is regarded as one of grime music’s most important figures thanks largely to the release of the ubiquitous ‘German Whip’, a huge breakthrough track which was the end-product of years of working to get to the top. The Four Owls are a quartet carrying the flag for British hip-hop, and carrying it with aplomb. The bird-themed super group comprises of four members who have each achieved an impressive amount of recognition on an individual level before coming together to form the collective, including Verb T, who is arguably one of the UK’s most respected MCs. This London duo are mainstays of the Hot Damn label. With influences of hip hop and grime in their sound, they’ve quickly developed into one of the most sought trap acts in the country. Their collaboration ‘Ball So Hard’ with Hucci is considered as one of the finest trap songs since the genre’s inception. One of trap music’s hottest prospects and someone who always smashes it live. A regular on Hot Damn’s releases and someone who has captured the diverse sound trap has to offer. He;s most known for his remix of Iggy Azalea’s fancy. Nottingham born JiKay comes to us fresh from a busy year with shows and studio sessions around the globe. Expect Hot Damn's founder to come prepared with a bag (or laptop) full of exclusive music from the label and beyond. He’ll be sure to smash it in his hometown. With her signature blend of hip-hop, house, trap and moombahton, tri-lingual rapper Zaiio fuses Moroccan influences and London swagger over an acrobatic rap style that’s unlike anything the industry has heard before. Pioneering, unique and brilliant.